From drive technology to automation, CNC punching machines have undergone a sea change of innovation and improvement, making them an indispensable high-tech staple of any successful fabricating operation. But given the whiz-bang nature of today’s punching equipment, tried-and-true punching basics still hold true. 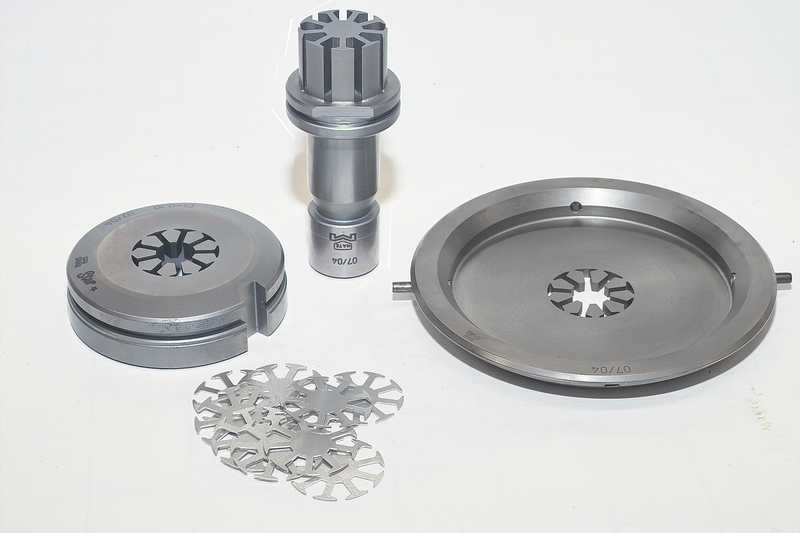 The following tips and tricks help ensure that your CNC-punch tooling will perform desired tasks across a long tool life. When blanking, use only sharp punches and dies, which increases the straight or burnished portion of the blank to provide straighter walls on required parts. Punches narrower than the material thickness are vulnerable to lateral forces that can bend and break the tool tip. A bent punch results in tight punch-to-die clearance on the side toward which the punch is bending, and the punch will dull quickly. In some cases, the punch can bend far enough to shave the die, damaging both tools. With this in mind, it is recommended to never nibble a strip narrower than 2.5 times the material thickness. Even during normal operation, narrow punches benefit from support at the punch tip. A fully guided assembly should provide such support with close stripper-to-punch clearance. Here, the stripper clamps material to the die during the working part of the stroke so that it can support the punch as closely to the tip as physically possible. Fully guided assemblies in applications using narrow punch widths result in consistent production and tool life lasting three times longer than without guiding. When specifying tools for blanking, notify your supplier of this fact. And remember, use nonslug-free dies and flat-faced punches. Use only sharp punches and dies. Doing so increases the straight or burnished portion of the blank to provide straighter walls on required parts. Reduce the die clearance by 5 percent. This helps to increase the burnish area and minimizes dimensional difference between the top and bottom of the blank. Inspect tools frequently for wear, as tools require sharpening more often when employing reduced die clearances. Sheetmetal fabrication often produces parts with rounded edges, many times via special tools that require the use of an index station. But in many cases, a four-way radius tool can be used instead, resulting in improved process time, reduced costs and reduced machine wear. Allows fabricators to produce corner radii with just one hit versus ribbing or use of a special tool. Hits all four corners simultaneously. Reduces or eliminates the need for an index station. Can fit into a single station or a multitool. Can be designed with micro-joint ends for shake-and-break parting applications. For continuous-parting applications, a four-way radius tool uses one vertical hit between the parts, which helps optimize sheet nesting. The tool also can help reduce machine wear. For example, for a sheet of 100 parts, a fabricator can punch the corners with 108 hits using a four-way radius tool versus 400 hits with a special tool and an index station. Quad-radius tools can nibble large holes with smoother edges and with far fewer hits than using round nibbling punches. For flexibility when performing corner-rounding, fabricators have options. A single nine-way corner-rounding tool provides nine external popular radii, from 1⁄2 to 1⁄16 in. Auto-index programming selects and rotates the desired radius to round off all corners of a piece-part. Fully guided tooling is recommended in such applications, as positive guiding action provides needed support when only one side of the punch is used at one time. 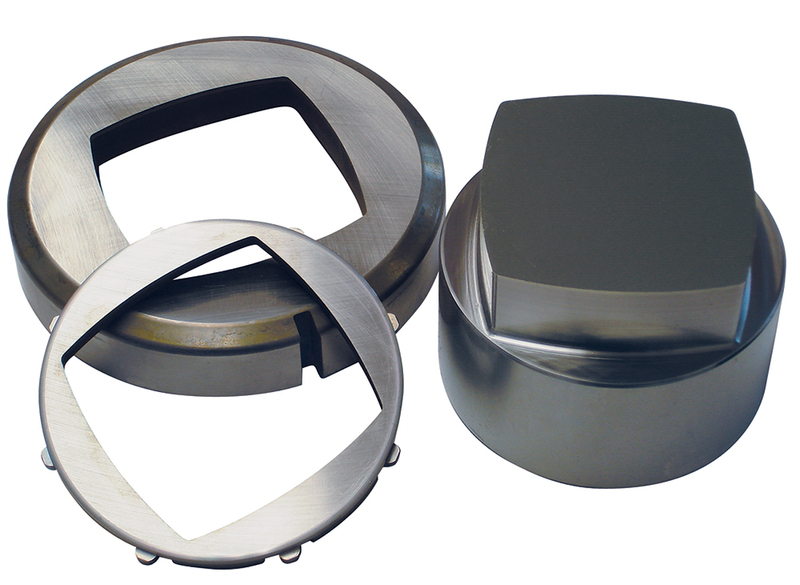 When specifying custom radii for corner-rounding tools, work closely with your tool supplier. For adequate corner-rounding performance, each radius should include at least 90 deg. of arc (1⁄4 of a circle). For adequate tool strength, the noses between the deep radii or groups of radii should be at least 0.188 in. wide. Any number of radii may be fitted onto the tool—limiting factors are tool size and strength. When punching relatively small-diameter or narrow holes, be sure that tools are properly sharpened and maintained. In general, for nonguided tooling it is recommended that punch to material ratio be 0.75:1 for aluminum, 1:1 for mild steel and 2:1 for stainless steel. For example, if the material to be punched is 0.078-in.-thick aluminum, it is reasonable to punch a 0.059-in.-dia. hole. When using fully guided tooling, recommended punch-to-material ratios are 0.5:1 for aluminum, 0.75:1 for mild steel and 1:1 for stainless steel. When producing large-diameter holes, although tooling is available for the largest tool station, such holes may exceed press capacities, especially when punching high-shear-strength materials. Here, creating the hole with more than one hit may solve the problem. Using smaller holes to break long perimeters on large tools can cut needed tonnage by half or more, without resorting to nibbling the entire periphery. Information for this article supplied by Mate Precision Tooling, Anoka, MN; 800/328-4492, www.mate.com. Yes! Finally someone writes about mega888 slot game. Good witch renouvelée saison 4 au printemps 2018.